Hervey Bay is a town located on the Fraser Coast and is one of the main launch points for Fraser Island. Known not only for its proximity to the world's largest sand island, it is also famous for whale watching and its many outdoor activities such as fishing, skydiving and sightseeing. The quaint town is often a stop-off point when touring the east coast of Australia, often before or after spending time on the famous Fraser Island. Click here for tours from Hervey Bay to Fraser Island. But not to worry - there is plenty to do while enjoying time in Hervey Bay, aside from waiting to go to Fraser Island! Much more than just a pit-stop on a road trip, it is a popular holiday destination, especially in whale season. There are restaurants, shops, car rentals and plenty of accommodation types while staying in town, not to mention the expanse of whale-spotting opportunities! Hervey Bay also has beautiful beaches that are ideal for relaxing, plenty of picturesque walks, a botanical garden and many markets to keep you busy for as long as you want during your time in Hervey Bay. Hervey Bay is located 3.5 hours drive north of Brisbane, and is accessible via several airlines which fly to the Fraser Coast. The accessibility of Hervey Bay makes it an easy escape if you're spending time in larger city centres or other parts of Australia and want to explore the Whale Capital of Australia. Many people venture to the famous Fraser Island from Hervey Bay, taking advantage of its closeness. To access Fraser Island from Hervey Bay, you can get the ferry at River Heads, 20 minutes south of the town, bringing you to Kingfisher Resort on Fraser Island. The resort itself is accessible by 2WD but all other parts of the island must be in 4WD; for this reason it's recommended if visitors drive only a 4WD from Hervey Bay to Fraser Island. If you don't have your own vehicle, there are still plenty of options for you to visit Fraser Island. 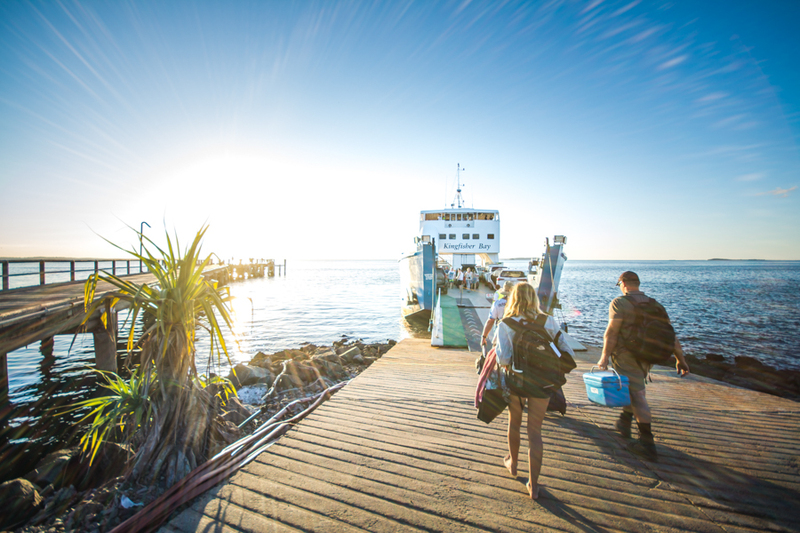 Many guided tours depart from Hervey Bay to visit Fraser Island, with many guests opting for a morning pick-up from their accommodation in town. This is a great option if you don't have your own vehicle or do not wish to drive on your tour that will still allow you to have the full Fraser experience!. It also offers the opportunity to meet new people and enjoy the beauty of Fraser Island with others, which is an added bonus to an already amazing adventure.